It’s been a long time since I last saw a decent extreme metal live and I really couldn’t wait for that one. 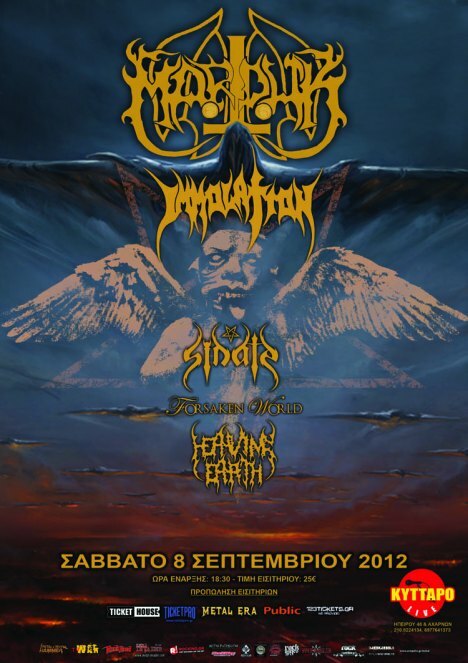 Another reason was of course that one of my favourite death metal bands, Immolation was on the bill. It was gonna be a hell of a night! I arrived just in time to see the second band on the bill, Heaving Earth from the Czech Republic, but I missed almost the whole set of Forsaken World from France. From the few minutes that I heard from Forsaken World, I could tell that they weren’t my style at all. A weird blend of every extreme style you could imagine made it very hard for me to enjoy their show. The crowd was between 200-300 people and the atmosphere was excellent. One of the first things I noticed was that the club had a second sound engineer close to the stage. The results were more than obvious; Heaving Earth had a crystal clear sound throughout the whole gig like the rest of the bands. It was the first time that I saw them play but you could tell that the band has been working a lot on their on stage appearance. An appearance which, combined with tons of killer rifing, made us warm-up our necks really good. They’re a very fresh band but I believe we’ll be hearing a lot from them in the future. The only thing I didn’t like much about them was probably the vocals, which weren’t bad, but weren’t very special either. The next band on the bill was Noctem from Valencia, a band that left me with mixed emotions after their show. Although they do have a very good on-stage presence I believe that they’re a little “too much” on certain aspects, whatever that means. However, their music is very good and that’s what matters here. Probably a little “cheesier” than I’ve used to, but their style is also a blend of extreme metal styles, so I believe that a little extra cheese always comes along. This isn’t always bad of course. It was time for the war machine name Immolation to take the stage by storm. And so they did, in every way possible. I really don’t remember much from the beginning of their show until the end of it, because I wasn’t even there mentally. They unleashed their music upon us and it really blew our minds of. Ross Dolan seemed extremelly happy with the constant positive response that he got from the crowd –which by the way has doubled until then- every time he yelled “Atheeeeeeeeeensss”, pushing the bands show into new limits. Robert Vigna is a league of his own, an everflowing death metal machine full of energy. You could easily say that he alone can erase from the map many new wannabe-deathmetallers who only know how to pose and look evil and stuff. I really could believe that I was witnessing such hatred unleashed upon us (yeah, I said hatred, sorry but Immolation are not hippie music!). Actually Robert and Ross seem like they haven't aged a day during the last 20 years. They still got they same fire and passion, and that goes for the rest of the band of course. Words are poor to describe their hellish performance of that night, a performance that is now carved in everyone’s mind forever. I definitely didn’t want this superb show to end, but Marduk had to hit the stage soon enough. After their show which lasted a little more than an hour was finished, I was really considering of going home (sorry Marduk!) because I wanted to keep the memory of their performance. Immolation are probably the best death metal band I’ve ever seen on stage, along with Cannibal Corpse. U.S.A for the win! After a long break Marduk were finally on the stage. Most of the crowd was still in shock after the Immolation gig, but we had to pull ourselves together once more. Sadly, Marduk was the only band which didn’t have such a good sound like all the other bands and that was a big minus in their performance. The other minus was that due to the time of their appearance, a lot of people started leaving to catch the last train or bus, something that you constantly see in a lot of gigs here. Too bad for them. Marduk started filling the atmosphere with their dark souls from the moment they came on stage until the time they left, which was a little more that an hour. They played some stuff from their new very good album “Serpent Sermon”, their 12th album, along with many their old classics. They played stuff from most of their discography, along with songs that they rarely play live. Their on stage presence is perfect, as it should be for a band who is on the top of the global black metal scene for 2 decades now. However, I wanted them to play a little longer… at least Mortuus made up for it, he is definitely one of the best black metal frontmen out there. I don't have a particular epilogue to say for that day, except the fact that we went back home torn to pieces. It surely was an one-of-a-kind show that blew our brains out like never before and no one can disagree.